NEW YORK, USA -- Twenty years ago, Mikhail S. Gorbachev announced the end of a huge global experiment. After seven decades, the Soviet Union would be dismantled, its 15 republics becoming independent countries, and capitalism replacing the planned Soviet economy. Lenin’s embalmed corpse was left undisturbed in the Red Square mausoleum in Moscow, but the cause for which he led the October 1917 revolution no longer held the affection of hundreds of millions of Russians and millions more around the world. For two decades since, the Russian people have largely endured in silence the oppressive and corrupt system of power that ensued — until blatant irregularities in parliamentary elections earlier this month sent an estimated 50,000 people out in protest. These protesters have planned what is expected to be the biggest demonstration since the fall of Communism for Saturday in Moscow. Vladimir V. Putin, the once and future president, is at last facing trouble from the streets. The terminal crisis of Communism, by contrast, was a quiet affair. The end of the Soviet Union was revolutionary, but it did not involve a crowd storming the walls of the Kremlin, an attack on the K.G.B. headquarters or calling up the Moscow army garrisons. Indeed the final days of the Communist era were remarkable for the low intensity of political activity of any kind. 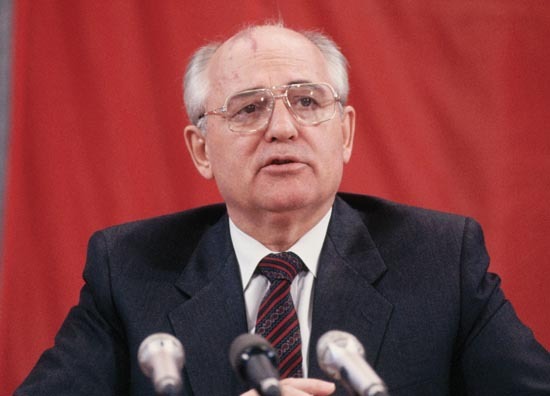 On national television, Mr. Gorbachev put on a brave face: “We’re now living in a new world,” he said during a Dec. 25, 1991, broadcast of his resignation speech. “An end has been put to the cold war and to the arms race, as well as to the mad militarization of the country.” But he could not disguise his regret that the Soviet order was about to be taken apart. Mr. Gorbachev was paying the price for his failures. The economic laws he introduced in 1988 had weakened the huge state sector without allowing private enterprise to emerge. He had irritated the country’s dominant institutions — the Communist Party, the K.G.B. and the military — but had merely trimmed their capacity to retaliate. By widening freedoms of expression, moreover, he inadvertently encouraged radicals to denounce Communism, despite his reforms. But the truth was that no such people existed. The Estonians, Latvians and Lithuanians pressed for independent statehood and chose their own Baltic patriots to lead them. The Georgians in 1990 elected a wild nationalist as president. Throughout the western and southeastern borderlands of the Soviet Union, the disintegration proceeded apace. In August 1991, while Mr. Gorbachev vacationed in Crimea, his subordinates acted to halt his reforms by staging a coup. But the plotters overlooked the need to apprehend Boris N. Yeltsin, an ex-Communist radical who had been elected president of the Russian republic two months earlier. Mr. Yeltsin raced to the Russian White House in central Moscow. Standing atop a tank, he defiantly denounced the plotters. The coup was aborted, and when Mr. Gorbachev returned from house arrest, it was Mr. Yeltsin who appeared the hero. Yet Yeltsin felt he couldn’t consolidate his personal supremacy unless he broke up the Soviet Union and governed Russia as a separate state. He and his supporters saw Russia as a slumbering giant with a future of enormous potential if the encumbrance of the other Soviet republics was removed. He saw Communism as a dead end and a totalitarian nightmare. And unlike Mr. Gorbachev, he was willing to say this openly and without equivocation. His opportunity for action arose on Dec. 1, 1991, when Ukrainians voted to break away from the Soviet Union. Without Ukraine, it was clear, the Soviet Union would face further secessionist demands. Mr. Yeltsin met quietly with the presidents of Ukraine and Belarus and came to an agreement to declare the Soviet Union abolished. Mr. Gorbachev had no choice but to agree, and the vengeful Mr. Yeltsin unceremoniously bundled him out of the Kremlin. The Russian people, it turned out, preferred to watch politicians on television rather than become active participants in the country’s transformation. They had long been cynical about Communist leaders, and the trauma of the arrests and executions during Stalin’s Great Terror of the late 1930s had made them wary about taking part in politics. Although thousands of young Russians had joined Mr. Yeltsin in defying the coup plotters in August 1991, civic activism declined as conditions worsened. As state enterprises underwent privatization, workers feared unemployment and resisted calls to go on strike. Russia’s manufacturing sector collapsed; only the petrochemical, gold and timber sectors successfully weathered the storms of capitalist development. A few businessmen became super-rich by exploiting legal loopholes and often using fraudulent and violent methods. Most citizens of post-Communist Russia were too exhausted to do more than grumble. Public protest against the Kremlin became more difficult under Mr. Putin. Elected to the presidency in 2000, and now serving as prime minister, he has used ballot-box fraud, disqualification of rival political candidates and control of national television to stay in power. Although he gained popularity for bringing stability, his own administration is now attracting growing hostility. Most Russians are sick of the corruption, misrule and poverty that plague their country while the Kremlin elite feasts on the profits from oil and gas exports — and who can blame them? At the turn of the millennium, 40 percent of the Russian people were living below the United Nations-defined poverty line. Rising oil prices have made poverty decline to some extent, but Mr. Putin has made no effort to eradicate it altogether. The opposition, having suffered from years of harassment at Mr. Putin’s hands, has not yet succeeded in taking advantage of today’s unstable situation. But the recent outburst of public protest has flummoxed Mr. Putin, as he finds that his authoritarian government lacks the pressure valves that allow liberal democracies to anticipate and alleviate expressions of discontent. Mr. Putin can no longer take his supremacy for granted. It is not yet a revolutionary situation. After all, Mr. Putin, like Mr. Yeltsin before him, can count on the money and pork-barrel politics needed to win the presidency next year; and he has no qualms about letting the security agencies use force. But Russians, having sleepwalked away from Communism, are awakening to the idea that if they want democracy and social justice, they need to engage in active struggle. Quiescent 20 years ago during Soviet Communism’s final days, they may at last be about to stand up for their rights.